Update, September 2016: Re-posting this because Le Sauce is TWO years old this month! Since this post a year ago, there have been issues on how to make an easy but killer PICNIC come together, an issue devoted entirely to EGGS (how to make the creamiest scramble, yes, but also how to make Sri Lankan egg hoppers!) and some of the FASTEST recipes you can make on a weeknight and still feel like you’re treating yourself well. 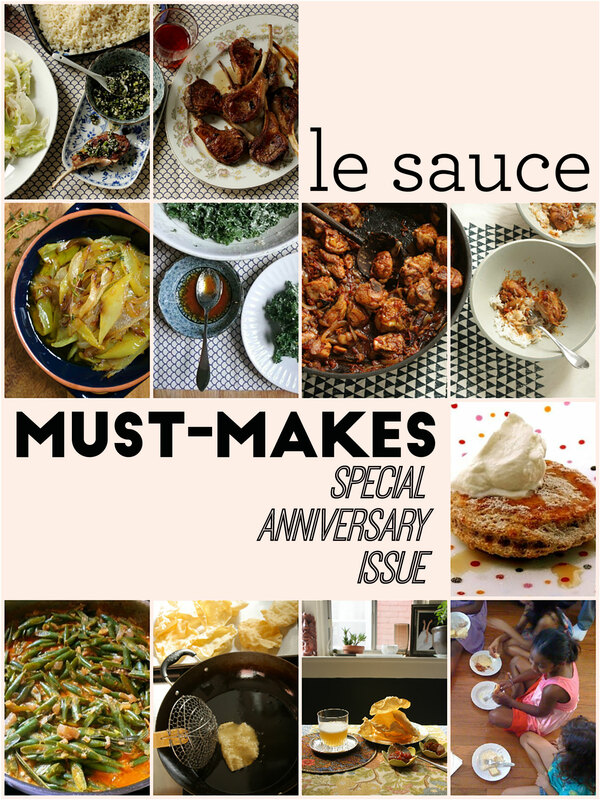 But the recipes in this MUST-MAKES, special anniversary issue from last year are still some of my favorites, and this issue is still FREE, so it’s a good time to remind you that you should dive into these recipes, and into Le Sauce Magazine, if you haven’t already. Eat and enjoy! I cook something different for dinner just about every night, not because I like to make work for myself (and trust me, I do consider cooking work), or because I don’t love a good plate of leftovers. It’s because I’m pining for new foods. Always. People throw the word ‘obsessed’ around, but I’m talking about desires that HAVE to be exercised. If I have an incredibly good plate of noodles at a restaurant one night, I will itch to make something similar at some point the following week. If, say, someone cancels on me and I have to postpone my visit to that hot noodle spot, the craving is even worse. Must. Have. Them. Or what I imagine them to be, based on the pictures everyone who has been to that spot is callously posting. Nothing else I eat has the ability to really satisfy me when these (agree we can call it this?) obsessions take hold. So, I get in the kitchen and try my best to make the thing myself. I was like this as a kid too, driving my mother crazy with my flights of fancy, begging her to recreate things she’d never even tasted because I would come under the influence of whatever I’d tried at new friend’s home (Filipino adobo), or a new after-school fast-food spot (Vietnamese barbecue). This kind of fickle infatuation is great for magazine-making! Fixating on recent meals at restaurants, food courts or dinner parties means I’m always game to make something new to eat at home, and coming up with new issues is no sweat. Except for the actual sweat, that is. Le Sauce Magazine is ONE YEAR OLD with this issue. And looking back, I will freely confess, I didn’t realize how much work it was going to be to put together. When I started out, I’d already written and tested, for my site, lesauce.com, about half of the recipes I was going to include in the first dozen issues, so it would just be a matter of curating recipes, writing an introduction to each theme, and making a quick cover. That’s what I thought. I severely underestimated, oh, everything. How many images would have to be re-shot because I just didn’t know how to wield a camera in the early days of lesauce.com. How long it would take to test the new recipes I needed to round out an issue. How crazy it would feel to work on 4 issues in tandem — when Le Sauce Magazine first launched, I was publishing 2 issues per month before going to a monthly frequency when it was clear that I had a lot of issues out and not many subscribers to see them yet, so what was the rush? And yes, even that last thing. How long it would take to build an audience. I’d had a small audience in mind to begin with, because Le Sauce is for people who actually cook at home, not people who just like food. (This difference accounts for the number of cookbook buyers to recipe Pinners, right?) You don’t have to be an especially skilled cook, though. None of my recipes are particularly complicated, I stay clear of intricate pastries because baking intimidates me, and you definitely won’t find me asking you to blow-torch, double-strain or even artfully arrange anything. If you cook, you’ll find all of the recipes in Le Sauce approachable, but more importantly, I believe that you’ll find that they are all really good. I take pains to ensure it, re-working recipes that need tweaking and tossing out ones that just don’t work out, editing them and asking others to so that I don’t waste your time in the kitchen. So I’m proud of anything that makes it into Le Sauce Magazine—and the things that made it into this issue? Well, these are the ones I want to grab people and insist they make. Because regardless of any fad that turns my head, I come back to these meals, I love them that much. That’s also why this issue is free. I want you to try them that much, especially if you’re new to Le Sauce. If you like what you see and taste, I’d ask that you please tell people you know who cook! Grab them by the shoulders and tell them they must download this (FREE!) issue and to make whatever you loved in it. And then, I hope you will both please subscribe. While I’m asking for things, one last ‘must’: after you find the recipe(s) in this issue you must make, would you share how it all went down? What you thought, what you changed, what you served it with, who at your table liked and didn’t like what. It would be awesome to know how this fit into your night/life/world.